It is that AGU-time of the year again! We can't wait for another opportunity to celebrate the successes of this year's internship cohort, catch up with our old friends from past years, and make new connections across years! 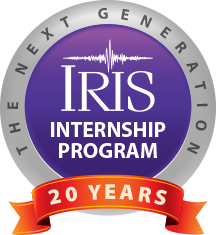 We have an additional reason to celebrate this year as the IRIS Undergraduate Internship Program is now in its 20th year and has supported over 200 students! *Please RSVP to Krystin Poitra <Krystin.Poitra@iris.edu> (or myself) by December 3, 2018.